Bangalore Bicycle Championships is going with first ever longest distance race in INDIA, its called as a Bangalore Classic Road Race. There will be two distance races, 132.6km Race for Elite and Masters and 72km Race for Amateur, Women and U-18. Race will be on NH-7 Bangalore - Hyderabad Highway. 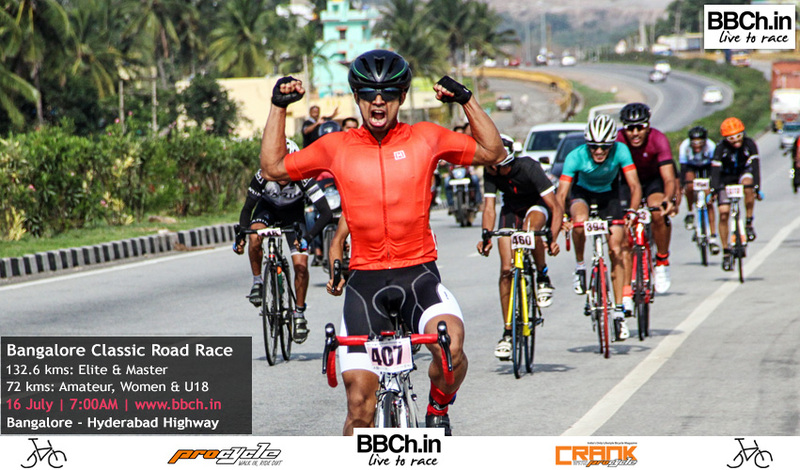 Get your race face on people and get ready for a rocking road season at the Bangalore Bicycle Championships. PS : Who participate in Elite should stick to Elite category for rest of the season, they cann't go back to Amateur in other road races of this season. Elite category is also open for anybody who wants to race but since that is the category where most of the pro cyclists take part, it is better to have some good level of experience to enroll into Elite category otherwise it might cause inconvenience for the entire peloton due to handling and skill set. Amateur category is open for anybody who wants to race irrespective of age. Participants age should be 40 years and above as on race day. Riders are free to participate in Elite/Amateur category if they wish to. Masters category is for anybody who is above 35 years of age irrespective of gender. - Girls below the age of 18 may opt for Women category also if they wish to. Under-18 category is common for both boys and girls who are below the age of 18. - Photo and Birth date ID card mandatory. - Its mandatory for parent/guardian/team manager to accompany the U-18 participants. - Parent/Guardian/team manager owns full responsibility of the safety of the participant. They will have to sign the indemnity form before issue of BIB, without which the participant will not be allowed to take part in the race. The race will start at 7AM as per categories. Get to the venue at 6AM. Make sure you pre-register and digitally sign your indemnity form online, so you just have to collect your bib numbers on race day. A banana and a bottle of water is NOT going to cut it! It’s a pretty even and smooth road surface. Water and refreshments will be available at the venue. Riders are expected to be on self supported race mode including mechanical fixing, flat fixing, carrying their own toolkit, towing of the cycle if required etc. The race referee reserves the sole discretion of analyzing any situation during the race and his opinion will be considered final. © 2009-2019 Bangalore Bicycle Championships. All Right Reserved.